Kore Press. 80 pages. 2012. 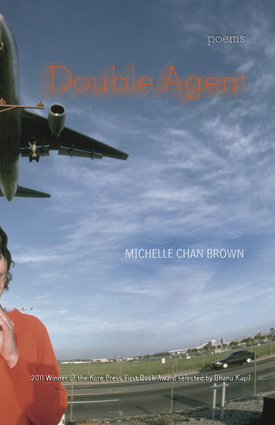 Michelle Chan Brown’s Double Agent won the Kore Press First Book Prize, selected by Bhanu Kapil, in 2011. I received the book a few months book and was sad it took so long to get to me and so happy it finally did. They lie naked. The moon landing is broadcast on television. The bugs flatten on them. They are as wondrous as cars. The act of contact equals the act of butchery. His belly is long and translucent, a sheet of glass. When they touch in dreams, she can make out what he consumes. All the curious jellyfish. This is an earthly poem about a celestial body. The brilliance of “Apollo 11” is that it is more about the lovers, the wives, the husbands, the astronauts, and their relationships in space to one another than it is about the moon landing. This, of course, makes the actual conquest event more epic, more human, and sexier. I’m terrified. Can I say that? I haven’t cleaned since I was born. that I eat standing up & lonesome . . . . He sniffs her coccyx, a mango from the black market. Ashgabat is lovely at this time of year. in flying leaps, or high-heeled goose steps . . . .
Brown’s connection to intimacy is this: it dips and bends between tenderness and that primal vortex of humanness that burns in all of us—violence. Not that kind of malicious violence that we hear of on the news but the sweet horrible acts/thoughts of violence that spring out of love. She knows this in her poems and so there is always a push and pull between the two that keeps us in the fun-zone. It’s so important, indeed, for that fun-zone to be present in poetry and it’s all over Double Agent. It’s the reason, the one singular reason that I love this book so much and that you should give yourself the opportunity to love it too—to put down the reading of this rumination and slip onto Amazon and ring it up. A pink cape, the bodies of the salmon. We know goodbye in six languages, hello in five. Say “hello” to Michelle Chan Brown’s debut collection, Double Agent, gather up your heart in its busts and pumps, and go.